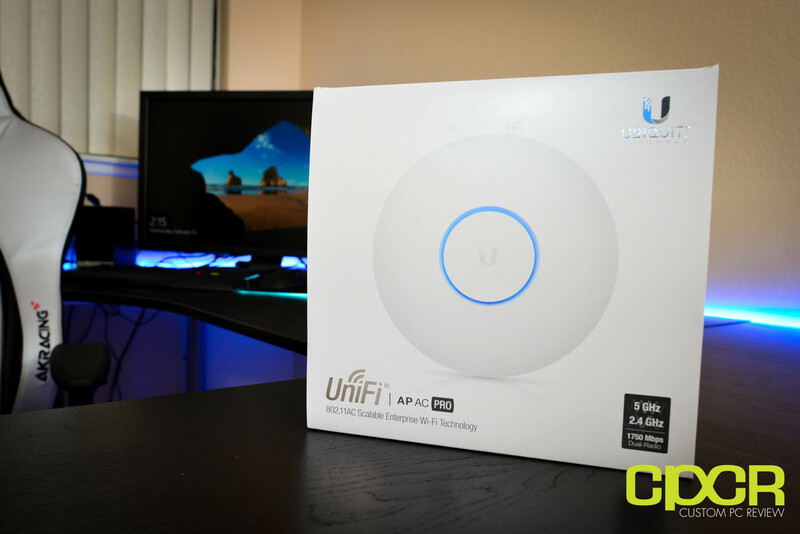 One of the most popular access points is the Ubiquiti UniFi AP AC PRO (UAP‑AC‑PRO), which we’ll be reviewing today. Before we begin, let’s first discuss what an access point is. While many of you have probably currently use Wi-Fi routers or Wi-Fi combo modems, an access point is something that’s not too common in today’s home or even small business networking landscape. The reason for this is because home networking devices are designed to be simple and low cost which means most home routers essentially have a switch, router, and access point bundled into a single device which most people simply call a router. In the enterprise networking world however, this is different. Typically, every networking device is a separate piece of hardware. This is beneficial for minimizing and isolating issues, and it also allows each device to handle significantly more users than if all the devices were combined. This is one of the reasons why your home router constantly gets bogged when only 10 or 20 clients are connected. The access point is a piece of hardware that is similar to the switch except expanding the amount of wired users that can be on the network, it allows Wi-Fi users to connect to the wired network. As such, this does mean that the network will still have to have a router in order to communicate with the outside world. 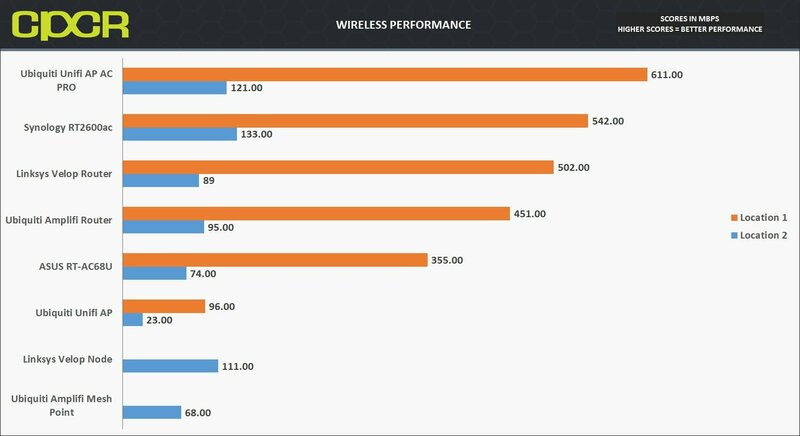 Taking a quick look at the specs, we can see that the Ubiquiti UniFi AP AC PRO is a relatively high end access point in the UniFi lineup. Featuring two radios for dual band (2.4GHz, 5GHz) connectivity, Ubiquiti has also outfitted the device with a 3×3 MIMO antenna array which should give us some very good performance. It’s also 802.3af PoE or 802.3at PoE+ compatible, so it can either be powered by a compatible switch/router or a power injector. 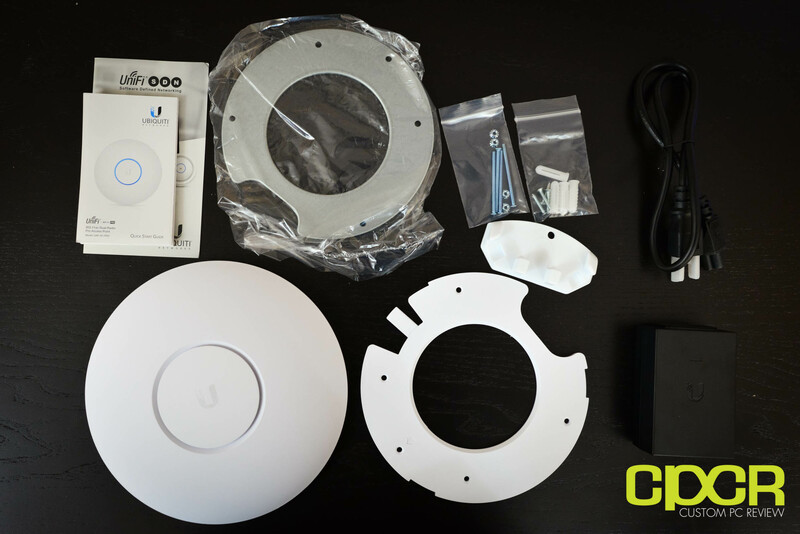 Here’s a look at the packaging for the Ubiquiti UniFi AP AC PRO. Included in the packaging is some documentation, wall/ceiling mounting plates with hardware, PoE power injector, and the UniFi AP AC PRO. The Ubiquiti UniFi AP AC PRO features a saucer type of design which is the design used for most of the UniFi AP lineup. The UniFi AP AC PRO is a fairly small device, measuring just 196.7mm in diameter and 35 mm in thickness. Inside the UniFi AP AC PRO is two radios: one 2.4GHz and one 5GHz. Each of these radios are connected to a 3×3 MIMO antenna setup. At the top of the unit, there’s a ring which will glow in operation, serving double duty as a status LED. At the bottom, the unit also comes attached with a removable wall-mount plate. At the bottom the UniFi AP AC PRO features two Gigabit LAN ports with one serving as the main port for data and power while the second port can be used as a unpowered bridge port for other devices. At the center is also a USB port designed to be used with a speaker attachment for those looking to have the AP pull double duty as a PA system. Ubiquiti does sell a separate access point, the UniFi AC EDU, which is the same as the UniFi AP AC PRO except also comes with the PA system included. In the UniFi AP AC PRO, Ubiquiti has also built in a channel to allow cables to be routed through for a flush wall-mount. Once the UniFi AP AC PRO is plugged in, the status indicator ring will begin to glow. Here’s a list of all the different status indicators available. 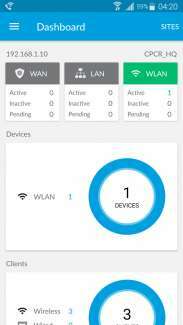 Administering the Ubiquiti UniFi AP AC PRO is done through the UniFi Controller software which is a unified management software for UniFi devices. This allows all UniFi devices on a single deployment to be easily managed through a single system. The interesting thing about the UniFi Controller software is that it’s actually installed on your system and all the data from the devices will be logged on your system rather than within the devices themselves. 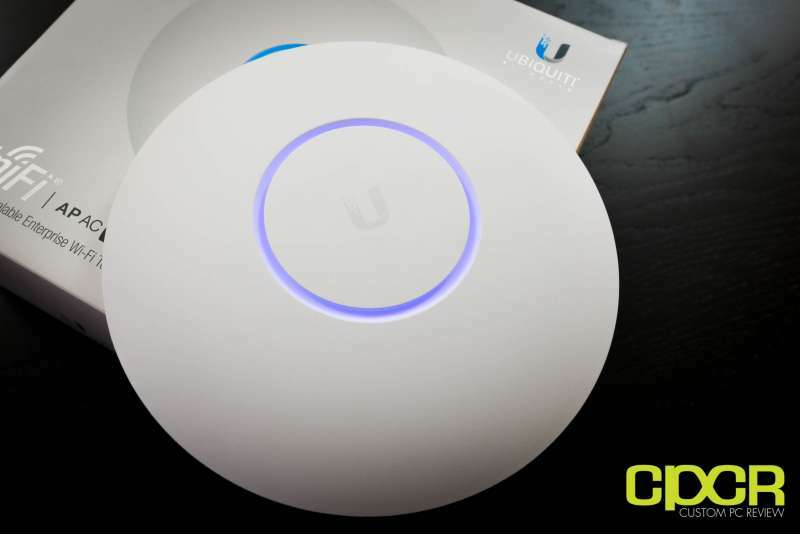 For those who want a dedicated device for running the UniFi Controller, Ubiquiti also sells the UniFi Cloud Key which will act as a dedicated UniFi Controller and provides cloud functionality so the system can be accessed remotely. 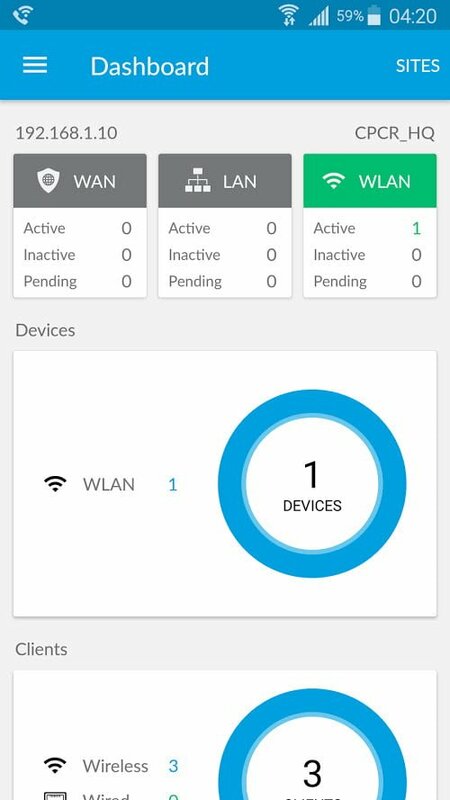 Once logged into the UniFi Controller, we’re immediately greeted to a quick status page which is relatively empty with the exception of WLAN which is lit up green. The reason for this is because the UniFi Controller is designed to be used with the entire UniFi product line which include the UniFi Security Gateways and UniFi Switches. Buried within the other tabs is a wealth of information about the UniFi network including how many clients are connected, MAC addresses, IP addresses, how much bandwidth is used, and more. 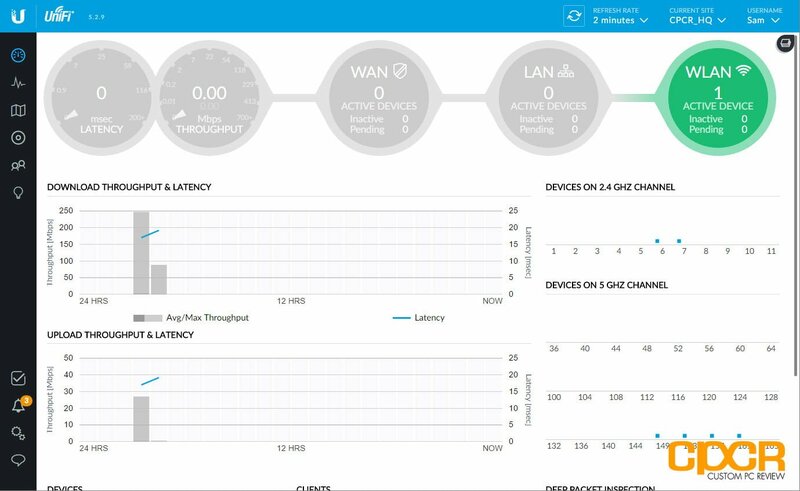 Diving into the management settings for the UniFi AP, we can see it’s packed to the brim with different information as well as different configuration options. 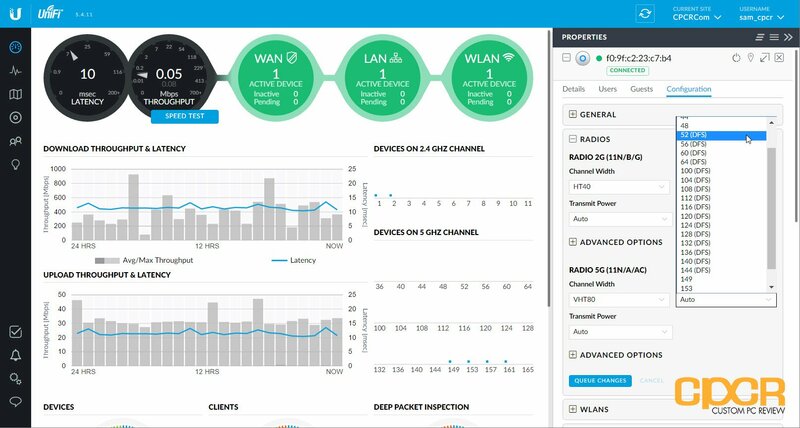 Some of the information here include the ability to monitor the access point and see who’s connected to the UniFI AP and at what type of speeds. Here we can also enable features such as VLAN, band steering and airtime fairness. There’s also a RF Scan feature as well which will scan the are for neighboring Wi-Fi signals to determine which channels are least susceptible to interference. As the UniFi access points are designed to be used in mass commercial deployments, turning on the Wi-Fi requires going into setup for the UniFi Controller. The reason for this is because once setup, the Wi-FI SSIDs, passwords, and other settings will automatically propagate to all UniFi APs. One great feature is the guest Wi-Fi portal which can be great for businesses such as coffee shops who need to offer Wi-Fi yet don’t want to give every store within the area free Wi-Fi. Here, a voucher system can be setup to limit access from unauthorized users. In addition to the UniFi Controller software, Ubiquiti also has a mobile app designed for both iOS and Android. The app is very feature rich as the majority of features in the web browser version of the UniFi Controller can be found in the app. Wireless performance is tested by connecting two systems, one server (Realtek 8111GR) and one client (Killer 1525). The server is connected via Gigabit LAN to a Cisco SG200-26 switch and the client is connected via Wi-Fi to the access point. Transfer speeds between the two systems is then tested using iPerf 3.1.3. 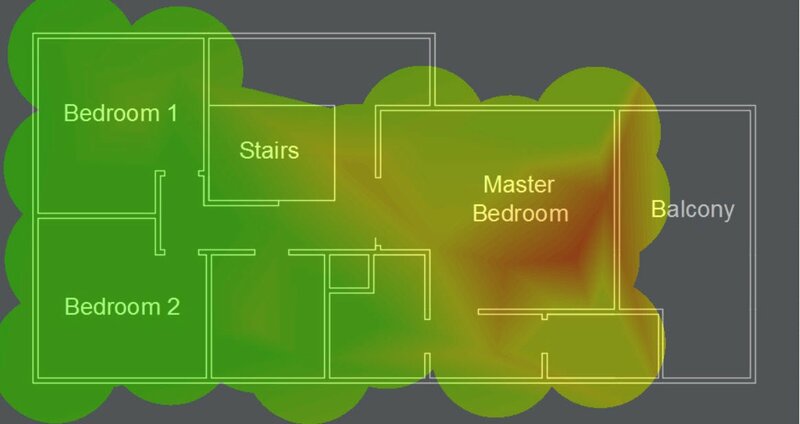 Wireless interference is minimized as much as possible however, there are still quite a few neighboring Wi-Fi signals from other residences around the area. Location 1 is in the same room as the router/access point with direct line of sight. Total distance between the router/access point and client is approximately 5 feet. Results of performance testing is in the 5GHz band (if available) which provides maximum performance. Location 2 is in the far end of a 1,500 sq ft two story, rectangular shaped house with the router/access point placed in one corner of the second floor and the client placed in one corner of the first floor. Total distance between the router/access point and client is approximately 40 feet with walls in-between. Results of performance testing are in the 5GHz band which provides maximum performance. The performance of Ubiquiti UniFi AP AC PRO in Location 1 was the best of any router/access point we’ve tested to date, reaching 611Mbps. This is significantly faster than even the Synology RT2600ac router we previously tested which features 4×4 MU-MIMO. Performance in Location 2 was quite good as well, reaching 121Mbps. That said, it did fall slightly short of the Synology RT2600ac which was able to reach 133Mbps. In order to test the Wi-Fi coverage of the system, I utilized NetSpot, which is an excellent free utility to produce Wi-Fi site surveys. According to the legend, red and yellow signify strong signal, green a good signal, and teal and blue a weak signal. Looking at the Wi-Fi survey, the UniFi AP AC PRO was very effective in covering the entire house with a decent wireless signal. Of course, the UniFi APs are designed to be deployed in quantities of more than one, so even larger homes or businesses should have no issues with coverage. 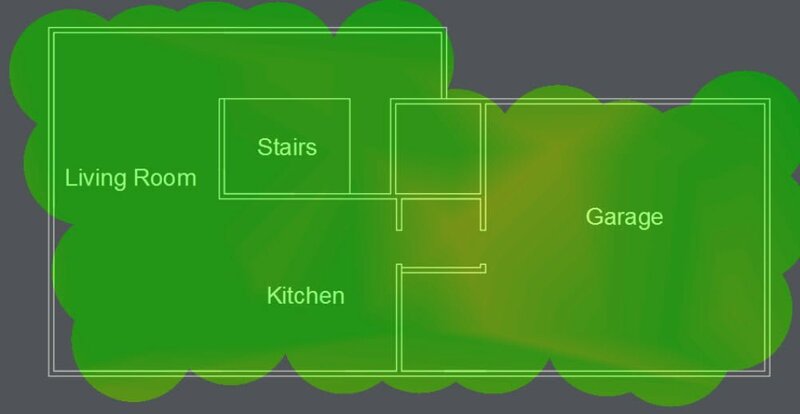 Within UniFi Controller, Ubiquiti does offer a mapping functionality to map out your network on blueprints to determine ideal locations for the access points. However, keep in mind the software doesn’t account for walls, building materials, vertical elevation, etc. so unless you’re placing UniFi APs in large open rooms, it may not be all that accurate. As a part of the IEEE Standard 802.11h, DFS, or Dynamic Frequency Selection, allows the use of spectrum in the 5GHz range reserved for radar systems when there are no radar systems operating at the time. As not many Wi-Fi devices support the use of DFS frequencies, this allows DFS supported devices to operate with less chance of wireless interference. In the configuration menu, we can confirm that the Ubiquiti UniFi AP AC PRO supports DFS. DFS channels are labeled “(DFS)” in the configuration menu. 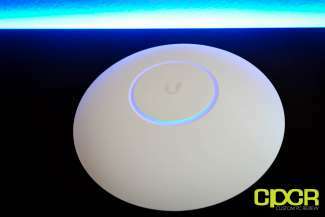 With all that said, is the Ubiquiti UniFi AP AC PRO an excellent product? My answer is an unqualified yes. 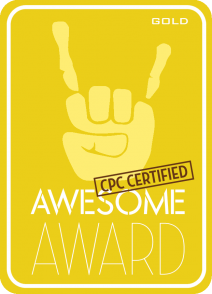 It’s powerful, it’s fast, it’s reliable, it’s highly configurable and it looks really, really cool. Although it’s designed for advanced users who need it to enterprise level deployments, Ubiquiti has done a great job making the UniFi AP AC PRO so easy to setup that even a typical home user can do it within a reasonable amount of time. Now, is it as easy as setting up one of the new mesh Wi-Fi systems out on the market? No, it’s not. But, its capabilities definitely make it worth the small learning curve. Looking at pricing, the Ubiquiti UniFi AP AC PRO is currently priced at $129.95, which is very competitive, even for a home or small business setup. Rather than buying a new router to replace one just that’s just one or two years old, picking up a UniFi AP AC PRO could be a very good choice to significantly improve the Wi-Fi capabilities of the network. For those without a router or one that’s very old, a Ubiquiti EdgeRouter Lite can be picked up for around $85.99, meaning a full Ubiquiti setup can be picked up for under $250. For the functionality and performance, there’s simply no better value out there. Highly recommended! Awesome! I bought one and want more functionality so I may go for one of thier routers too. Thanks for this great article, was getting 80mbts, then changed cables and was getting 200-300mbts. After reading this seeing your results I did some more research. Disabling broadcast traffic traffic and changing the 5g radio to vht80 my galaxy 8 was reporting 950mbt connection. Was able to achieve 900mbt results with iperf3. 80mbt to 900mbt was an awesome boost!